San Francisco — Over the past few years, Nicolas Lobo has narrowed his interdisciplinary practice to hone in on the peculiar life-cycles of various mass-produced consumer goods. Purple cough syrup, breakfast cereal, energy drinks, and donut frosting are just some of the unorthodox substances Lobo reduces to their chemical substrates in order to recast them in customized distribution networks of his own devise. Now stripped of their original utilitarian intent, Lobo takes these elemental building blocks and stages dramatic collisions between wildly disparate materials to coax a moment of heightened reappraisal in the viewer. What was once so ubiquitous as to be largely taken for granted, is now experienced in a more primal, bodily capacity. In fact, it is a visceral awareness of the body’s own vast distribution network of neural synapses, branching capillaries and aortic superhighways – its chain of complex chemical reactions – that Lobo strives to activate in his work in order to orchestrate a reconsideration of both commercial and biological systems and their fundamental interplay. 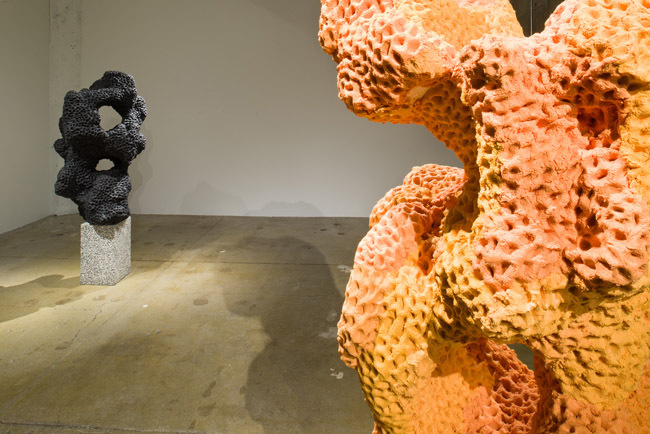 For D.O.W., his solo presentation at Gallery Wendi Norris, Lobo will present three “Napalm Scholar Stones” sitting on terrazzo pedestals, amplified in scale to approximate the human body and situated irregularly in the space in the manner of traditional Zen rock gardens. Originally conceived as objects of contemplation, meditation and inspiration among painters and poets in China at least as far back as the Song dynasty (960-1270), traditional scholar rocks or scholar stones, as they came to be known, are miniature, executive-desktop scaled versions of their much larger outdoor cousins, designed to bring the beauty of nature indoors as a spur to the creative act. Physically reminiscent of coral reefs as well as the majestic mountain ranges they were initially meant to evoke, the pocked and dimpled surfaces of these crusty biomorphic forms instill a quiet reverie courtesy of their perfect fusion of the celestial and the cellular, the transcendental and the geological. It is a blissful moment of peak experience that Lobo wishes to disrupt. By pouring gasoline on blocks of polystyrene in an improvisatory manner, Lobo melts segments of the block away until he chances upon the perfect asymmetric armature or superstructure. This proprietary “napalm,” true to the original ingredients of the horrific, jelly-like incendiary initially invented and mass-produced by DOW Chemical specifically to cling to human flesh, is then coated with a skin of Play-Doh forcing us to juggle two distinct symbol systems – one, sinisterly destructive; the other, innocently procreative. Lobo “completes” each sculpture by vigorously impressing his fingers across its entire surface. Though evidence of the artist’s unique hand is writ large over every square inch of each object’s topology, the intent is less triumphal autographic stroke, and more a willingness on Lobo’s part to make himself complicit in the sometimes haunting, sometimes delightful trajectory that is napalm and Play-Doh’s curious industrial endgame.